Karl Marx, taking his cue from Hegel, once commented that great historical events occur in two versions: first as tragedy and second as farce. Let’s parse the farce part first. Clearly, Nickelodeon should reconsider starting a new channel in Riyadh; ditto for prospects of Disneyworld-Damascus; and although Bullwinkle might look cool in a burka while his infidel sidekick Rocky zooms around with a bomb strapped to his chest, that probably isn’t in the cards, either. Since Muslim rent-a-mobs seem temporarily to have run out of European banners, lighter fluid, and Kransekage (a pastry) to heave away, this seems an appropriate time to ponder the meaning of the Flaming Flags of February. In between sips of espresso and bites of Danish—the sweet rolls, that is, not the cartoonists—one cannot help but be stunned by the insanity and inanity, as well as by the deadly dangerous nature of it all. The insanity bursts from headlines like exploding shells in an artillery barrage (sorry, bad analogy). Still, consider those blazing captions that assaulted the eyes of ordinary consumers of news for the past five or six weeks: Dozens were killed—yes, that’s killed, not injured, scuffed up, inconvenienced, insulted, or afflicted with depression, but killed—in protests over what they regarded as irreverent depictions of Muhammad in cartoon form. From Copenhagen to Karachi, outraged imams screamed for apologies, and, à la Salman Rushdie, at least one decree has been issued, with a million dollar prize to boot, for the death of the perpetrators. Even the most deranged cerebral meanderings of a Salvador Dali would be challenged to depict scenes as surreal as these. Now for the inane part. Prime ministers, foreign ministers, domestic ministers, as well as the rather more ordinary (and rare) religious ministers all condemned the violence—on their ways to a local mosque to genuflect, of course. Most of all, they just wanted the whole business to settle down, to go away, in order to better establish peace for our time. We (Europeans, Westerners) must be sensitive to Muslim feelings; we must recognize there are limits to free speech; and (unstated, I’m sure) we must all somehow try to grasp the thought processes of individuals willing to murder for their religious beliefs. 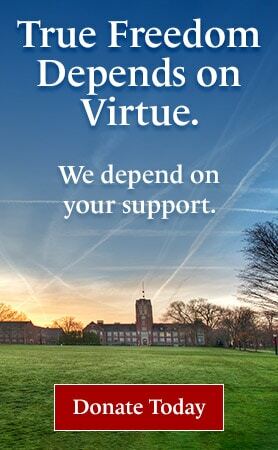 (Voltaire help us!) All the while trying to figure out how the gentle state of Denmark somehow got transformed into the Third Reich overnight. This is the deadly serious part of the cartoon controversies that Western leaders just don’t get. Muslim violence and demands must be understood for what they are, and appeasing radicals with bromides about sensitivity while making concessions on freedom of speech will accomplish nothing more than what the hapless Chamberlain discovered in 1939; in that case, “peace for our time” lasted about a year. The only question for the heirs of Chamberlain today is, how long will it last this time? 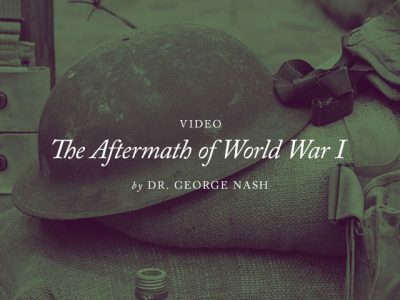 2018 — Annual Conference — Video — “The… Dr. George Nash kicks off the 2018 Center for Vision & Values annual conference: World War I and the Shaping of the Modern World. This entry was posted in Military & Foreign Policy by Marvin J. Folkertsma. Bookmark the permalink.